Ecommerce has been around for over twenty years, but things are just starting to heat up. Right now, the industry is seeing major growth as consumers are making more purchases online than ever before. Not to mention that some of the key players, such as Amazon, are looking to take things to the next level with all sorts of futuristic innovations. Here are four global trends happening in ecommerce right now, and what they mean for vendors like you. According to a new forecast published by eMarketer; China – the world’s largest ecommerce market – is expected to reach $1.12 trillion in retail ecommerce sales in 2017. Mobile purchases are driving much of this growth: “By the end of 2018, more than 75 percent of ecommerce sales in China… will be transacted via a mobile device,” says eMarketer. This creates a huge opportunity for ecommerce vendors looking to break into the global market. It also prescribes a method for success; primarily to focus upon and improve mobile usability to widen your reach and increase sales. By now you’ve probably heard Amazon agreed to buy Whole Foods for $13.4 billion. This will, without a doubt, transform both companies and could make it easier for consumers to purchase their groceries for home delivery. While the ecommerce giant has sold food and drinks online for nearly a decade, they’ve struggled to capture a major share of the grocery market. By purchasing an upscale grocery chain with plenty of clout, Amazon has once again made a strategic move to shut out big name competitors like Walmart. If Amazon succeeds, U.S. consumers may become more comfortable with ordering meat, fruits and vegetables online; which could drive more ecommerce SMBs to jump into the game by offering grocery bundles via a subscription service. New entrants are joining the industry thanks to easy-to-use free ecommerce website builders like Shopify. Vendors wondering how to sell an ebook online or how to start their first e-store can access a simple template builder with all the features and functionality of a big-name site; thereby combining simplicity of use with tremendous power. Same-day delivery and in-person pickup locations are becoming more the norm for big ecommerce sites as well. Sure, right-away delivery might be expensive, but some customers are willing to pay the price for faster service. On the other hand, in-person pickup saves shoppers and businesses money. A win-win! As big players in digital retail explore faster delivery options, smaller ecommerce vendors might struggle to keep pace. If you’re among the latter category, you’ll do well to explore expedited shipping or cheaper ‘no rush’ shipping options to keep you customers happy. As ecommerce grows, so will the demand for storage space. In fact, analysts at Jefferies estimate ecommerce vendors need three times as much warehouse space as brick-and-mortar retailers. However, the U.S. is severely lacking in warehouses and distribution centers. Even Amazon is struggling to keep the pace of supply chain build out in synch with growing demands. One solution is to repurpose America’s shopping malls as warehouses for ecommerce businesses. This could also make it easier to distribute products in a timelier manner, as well as accommodating in-person pickup, thereby benefitting businesses and consumers. 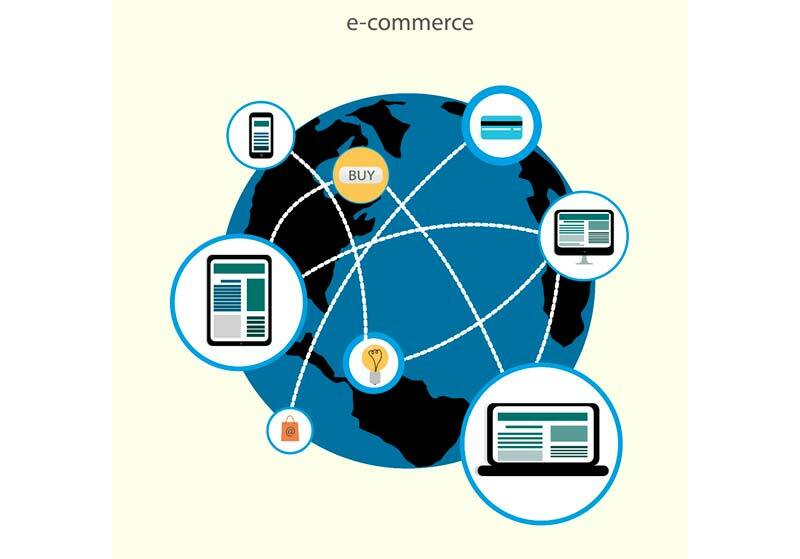 It’s anybody’s guess where ecommerce goes from here, but one thing is certain – these global ecommerce trends hold a great deal of potential for the smart entrpreneur.